Sunday marked my third (yes, third) half-marathon race. Just typing that makes me a bit excited. To think that I ran my first half just last October and now have three under my (race) belt is pretty satisfying to say the least. As I mentioned in a previous post, my marathon training plan (for Newport in June), called for a half as part of the preparation and the timing of this one was just about perfect. 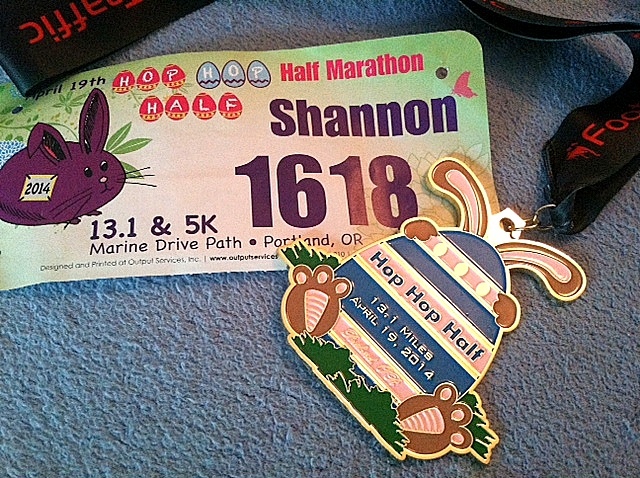 This was the first year for the Hop Hop Half (I’ve got to admit, I’m not a huge fan of the name – a bit cutesy for my preferences – but I do understand the desire to tie it in with the holiday) and going in to it I felt like it may have been a bit of a risky move for the race sponsors. Coming on the heels of the Shamrock Run, which is a very popular and large event, I wasn’t sure how the turnout would be. It turned out to a moderate-sized, but lovely race. I had a strange set of feelings and expectations heading in to this event. For the first time, this was not the event I’d been training for, but was part of a bigger picture. Because of that, I didn’t want to place too much pressure on myself, but did want to give it a good effort and see how my racing ability was progressing. Race day started out well enough. It was a bit chilly at the start, but dry and sunny – perfectly good racing conditions. The event started off with a 5k that was winding down by the time the half-marathoners got going at 8:20am. I think it’s worth noting that the race started pretty close to the scheduled time (only a minute or so late). An on-time start always pleases me. The race started off well and was fairly uneventful (in a good kind of way). The first couple of miles weren’t the most interesting to run, but after about mile 3, we made our way onto a path that travels right alongside the Columbia River. It was beautiful! On such a lovely Spring morning, the sky was relatively clear, providing a beautiful view ahead (to the East) of some of the gorgeous mountains in the Pacific Northwest, to the left of the Columbia, complete with seagulls stretching, soaring, and basking in the sun, and the Portland Airport to the right (which may not seem like much, but is actually kind of lovely to see from that vantage point). I’m the one in the center of this photo – in all black! The course was pretty darn flat, so I chugged along steadily most of the way. I did encounter an uncomfortable situation right after the turnaround point (around mile 7, I think it was). I wanted to share it because it was so unusual and am curious if others have encountered this. I was coming up behind another runner ahead and was running at a slightly faster pace than he was, so I was nearing him. I was clearly going to pass him, so I maneuvered to the left, where there was space to move around him. He glanced over his left shoulder, saw me coming, and moved directly in front of me to block my path and cut me off from passing! It was very apparent that it was no accident. I had indicated my intent to pass by when he looked back at me and he made a very deliberate shift in his position on the pathway. I was shocked. Seriously, seriously shocked. Neither of us are elite runners, we weren’t racing to win. Furthermore, even if we were, that is not how runners behave in my experience. I am so used to friendly runners. Runners who respect each other and share a certain camaraderie, even in competition, that I was totally taken aback by what happened. Has anyone else had this happen? I will say that I eventually still maneuvered around him and never saw him again. Plus, my faith in the goodness of runners was restored later in the race, with less than a mile to go. I was right at pace with another male runner and eventually started to pull ahead. Instead of another weird encounter, this runner nodded and encouragingly shouted “Looking strong!” It warmed my sappy runner’s heart. When all was said and done, I finished with a new half-marathon PR – 1:49:17 – and placed 91 out of 618 total finishers! I’m totally happy with my performance and finish, though it didn’t take long for me to realize that in just about 10 weeks I would be doing it again – twice. Me in black again – heading towards the final mile! A couple of other notes on the event and race. First, runners were treated to complimentary mimosas after the event. Nice. I much prefer this to the beer that is often present after a race! While I certainly know that taking in alcohol is not the best recovery plan, I did enjoy my free brunch-y cocktail after having a couple cups of water. I definitely approve of this beverage choice! Second, along the way, I noticed a very young runner participating with an adult by her side. Curious, I looked at the age group results after they were posted and saw that an 8-year old girl finished the half-marathon in just a bit over 2 hours! I am so impressed by that. She looked like she was having the time of her life when I saw her on the course and I am so inspired by someone of that age having the focus and dedication (not to mention the skill) to do that run. I can only wish I had had some of that when I was so young. Amazing. 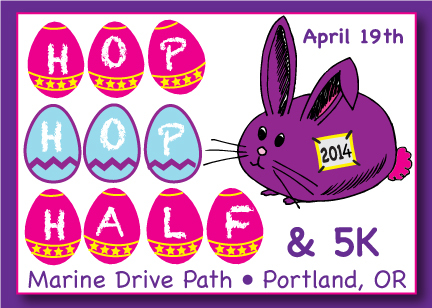 Hats off to Foot Traffic (one of my local running stores) who organized the event. It was a smooth race and delightful event to kick off the spring running season! I would absolutely consider running it again next year. Holiday Half-Marathon Race Recap: Rain, Wind, and A Wardrobe Malfunction . . . But So Worth It! I’ve been so busy and distracted that my second half-marathon kind of snuck up on me. All of a sudden, it was two days away and the reality started to set in! I picked up my race bib on Friday and those pre-event nerves started to kick in. In true Me fashion, I had a clear, verbalized goal and a secret goal that I didn’t really talk about much. I was nervous about what my race time would be for a couple of reasons. First, the weather. Cold, wind, rain, all of these can definitely slow a runner down a bit. I run in the rain often, but I hadn’t raced in it yet. Second, I had been feeling a bit run down. My body was feeling generally tired and achy and I wasn’t sure how that would show up come race day. So, as it stood, my verbalized goal was to stay under 2 hours. As I had managed to do this in my first half two months earlier, this was important to me to repeat. My secret goal was to beat the time in my first half and finish in under 1 hour 55 minutes. Final Race Time = 1:51:42! Woot! Now, I know race times aren’t the most important thing in the world, but I’m a pretty goal oriented person. I like to have benchmarks and plans and something specific to shoot for, so for me, it matters. And this particular finish mattered a whole heck of a lot. Race day started off in a bit of a nerve-racking fashion. Remember how I mentioned that my body had been generally achy? Well Sunday morning I woke up to shower, dress, and prepare for my race with a seriously uncomfortable right hip, thigh, and knee. It didn’t hurt, per se, but it definitely felt uncomfortable and I was worried about how it would impact my experience. What DID hurt were my fingers. I have this strange condition called Raynaud’s Disorder. No one seems to know what causes it for me, but it’s bad. Like, really bad. My fingers start to get really cold and then they burn. Then, they go numb in spots and still burn in other spots. They turn all the colors of an American flag and become a painful, distracting mess. Sunday morning, my friend Raynaud decided to go nuts. So, there I was waiting for the start with my uncomfortable hip and leg, my burning, numb fingers and my nerves. Finally, we got started and I was no more than a few feet across the start line when I felt my torso get really cold. I looked down to see that the bottom zipper on my double zipper jacket had come undone. The top zipper (near my neck) was still secure. So if you can imagine, it was instantly like I was wearing a cape, but backwards. My jacket, purchased to shield me from the cold and wind and rain, was instead flying open, exposing me to all the elements. I tried to fix it while I ran, but, you see, when my fingers go numb, they don’t really work. I can’t pick things up or close them tightly around things, so it didn’t go so well. Finally, I made a decision that I was not happy about. I ran to the side of the road and had to stop completely and take the time to get my jacket fixed. I was not happy about this. Stopping? I don’t stop during a race! Okay, so I get going again and, at least from there, no new problems occurred. The race was pretty flat, so that wasn’t bad at all, but there sure were stretches with some serious wind gusts and rainfall. There’s something about running through all that, though, that feels liberating and strong. Or maybe I’m just a little bit crazy. Either way, I felt good most of the way. The route itself was quite pleasant, meandering through neighborhoods in North Portland. I passed plenty of houses with festive lights on them, as well as a few carolers along the way that volunteered their time for the race. I felt like I was pushing myself, but not overdoing it and I had the energy for a good kick during that last mile. Finding out my finish time was fantastic. Seeing that measurable improvement over my first race, combined with the actual physical change I noticed in my body during this run (less fatigue, more strength, more power) made all the mishaps of the day so very worth it. What a great way to ring in the holidays! 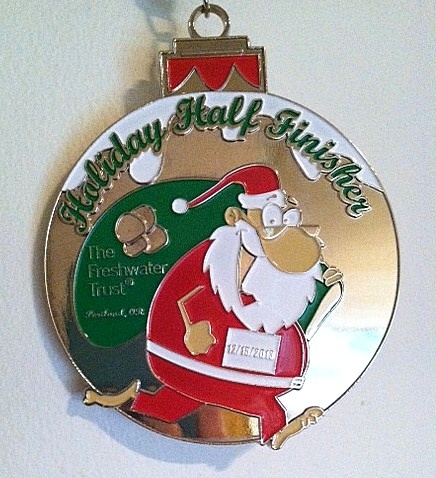 Only Seven Days Until the Holiday Half! 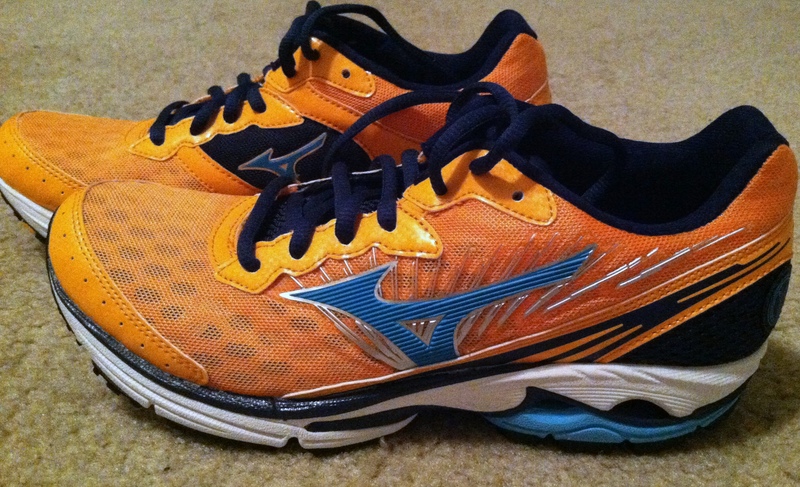 Seven days until my second half-marathon! 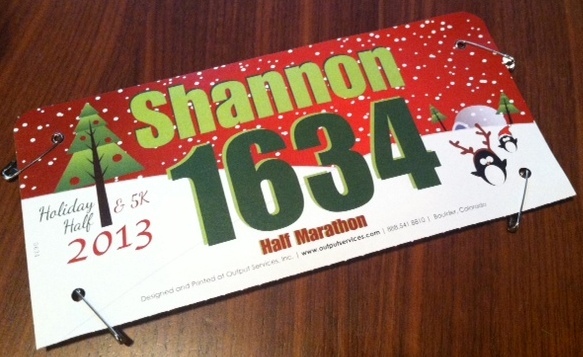 I’m racing the Foot Traffic Holiday Half next Sunday. My mind has been so focused on thinking about what my 2013 racing calendar will bring that I keep almost forgetting that this race is right around the corner. 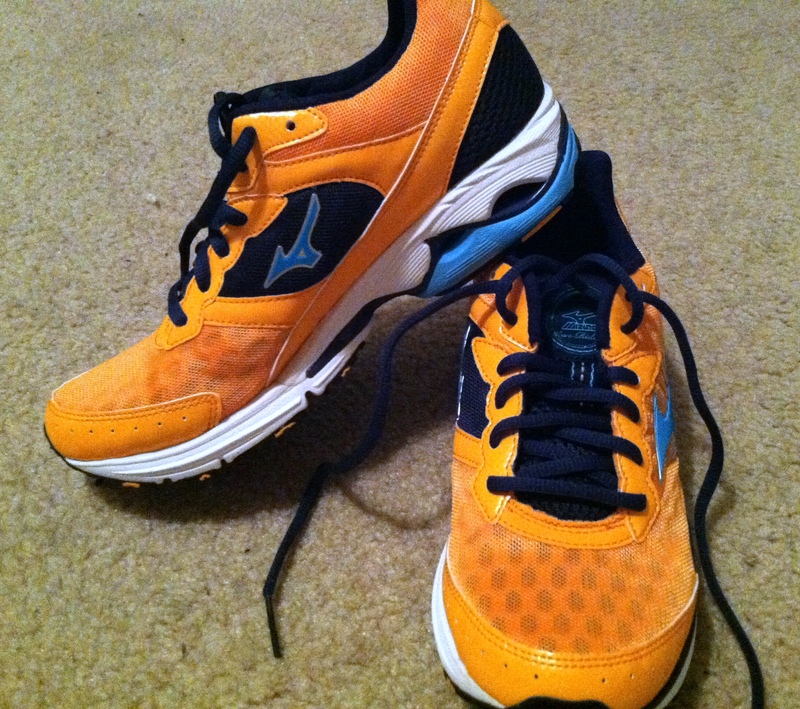 I am quite looking forward to running it, though, as it is North Portland, where I’ve never run before. Starting and ending near the Adidas Campus, the run loops through North Portland and under the St John’s Bridge. I suspect that it will be quite lovely. I’m hoping for a PR by beating my time at the Portland Half-Marathon in October, but I’m also realistic that it may not necessarily happen. The weather could be interesting. I don’t mind running in the rain so much, but it does slow me down a bit. I guess we’ll see in seven days! I will certainly let you know. . . Wish me luck?